Mark Phillip Hertling (born September 29, 1953) is a former United States Army officer. He served 37 years in the U.S. Army and retired after serving as the Commanding General of U.S. Army Europe and the Seventh Army, serving in that position from March 25, 2011 until November 4, 2012, and retiring from the Army in December 2012. During his time as a U.S. soldier, Hertling served in Armor, Cavalry, planning, operations and training positions, and he commanded every organization from Platoon to Field Army. Most notably, he commanded the U.S. Army's 1st Armored Division and Task Force Iron/Multinational Division-North in Iraq during the troop surge of 2007 to 2008. In 2013, Hertling became a Senior Vice President for the Florida Hospital organization in Orlando. While serving there he developed a successful Physician Leader Development course for that organization and in 2016 published the book Growing Physician Leaders. In September 2013, Hertling was appointed by U.S. President Barack Obama to be one of 25 people serving on the President's Council on Fitness, Sports, and Nutrition. He served as a Council member until 20 January 2017. He also acts as a senior advisor to "Mission Readiness", a nonprofit, bipartisan organization of retired military leaders who call for smart investments for U.S. children; he has served as a board member for World TEAM (The Exceptional Athlete Matters) Sport, an organization providing opportunities for physically challenged athletes; and he serves as an advisor to "Operation Gratitude", an organization supporting deployed military and their families. In 2016, he was named as an Adjunct Scholar to the Modern War Institute at the U.S. Military Academy at West Point. Hertling was born on September 29, 1953 in St. Louis, Missouri. He attended Christian Brothers College High School in Clayton, Missouri, graduating in 1971. He is also a member of the CBC Alumni Hall of Fame, having been elected in 2010. In 1975, Hertling was commissioned as a second lieutenant in the Armor Branch after graduation from the United States Military Academy at West Point. While at West Point, Hertling was on the NCAA Division I Swimming and Water Polo Team, and he was active as a member of his class committee and attained the rank of Cadet Captain his senior year. Hertling received a Masters of Science in Physical Education from Indiana University, a Masters of Military Arts and Sciences from the Command and General Staff College at Fort Leavenworth, Kansas, and a Masters of National Security and Strategic Studies from the National War College in Washington, D.C. In 2016 he was accepted into the Executive Doctorate of Business Administration program by the Crummer Business School, Rollins College. Hertling became the first Deputy Commanding General for Initial Military Training. 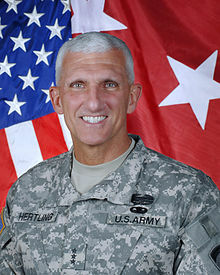 Prior to his final posting as the USAREUR Commander, Hertling commanded the Army's 1st Armored Division from 2007–2009, and he was the first Deputy Commanding General for Initial Military Training (IMT) from 2009–2011. In the former role, he commanded the "1st Tank" in both its home location in Germany, and as part of the surge in Iraq. In Iraq, Task Force Iron was based in Tikrit, and cooperated with five different Iraqi Army divisions in a security and on a "whole of government" approach. As a combined force, these units conducted many operations to strengthen the Iraqi Security Forces and the provincial governments in the four Arab and three Kurdish provinces in the north, and they contributed to significant improvement in the economic and security conditions in the region. Hertling integrated a series of named kinetic operations ("Iron") with a unique series of non-kinetic engagements ("United and Strong") to further improve stability, government, economics, and security. As the first Commander of IMT, Hertling was responsible for integrating the initial training of approximately 160,000 officers and enlisted soldiers entering U.S. Army training every year at 27 installations across the United States. Hertling led significant change in several areas, including integrating new training methods into basic combat training, advanced individual training, and basic officer leadership courses. IMT revised the Army's Warrior Tasks and Battle Drills and developed further training in rifle marksmanship, combatives, values instruction, first aid, and cultural training. IMT's "Soldier-Athlete" initiative also brought about innovative changes in physical readiness training, introducing athletic trainers and physical therapists to training units, and integrating performance nutrition into Army dining facilities ("Fueling the Soldier"). Complementing Soldier Athlete, Hertling recommended a radical change in the Army's Physical Readiness (PT) test, a recommendation which was later rejected by the Army. Throughout his military career, Hertling saw alternating assignment between operational and training postings, and he gained a reputation as a skilled trainer and a soldier-focused leader and commander. He has been assigned to all of the Combat Training Centers in the United States and Germany, expanding the center in Europe. Hertling has influenced the training model in the U.S. Army at various stages of his career. Hertling served in various command and staff assignments, both in the continental United States and overseas. He began his professional career in Europe as a second lieutenant, leading tank and scout platoons in the 3rd Infantry Division in 1975–1977. In 1988, he returned to Europe as a major, serving first on the staff of the 1st Armored Division as the deputy G-3, then as the S-3 of 1st Squadron, 1st Cavalry Regiment (Blackhawks) with whom he deployed during Operation Desert Shield/Desert Storm. The 1-1 Cavalry was cited for its role in the Battle of Medina Ridge, where Hertling was wounded in action. Hertling also commanded 1st Squadron, 16th Cavalry Regiment at Fort Knox, Ky. He also commanded 3rd Brigade, 2nd Infantry Division at Fort Lewis, Wash. when that unit was named as the Army's first Stryker Brigade. He was Commander of Operations Group, National Training Center and Fort Irwin, Fort Irwin, Calif., and commanded the 7th Army Training Command, transforming it to the Joint-Multinational Training Command, in Grafenwoehr, Germany. He also served as the Vice J-7 and the J-7, on the Joint Staff in Washginton, D.C. from 2001–2003, and as the U.S. Army Europe G-3 from 2005–2007. His overseas assignments include responsibility as the Commanding General, 1st Armored Division/Multi-National Division-North, as a major general from October 2007 to December 2008, both in Wiesbaden, Germany and in Iraq during Operation Iraqi Freedom. Prior to this, as a brigadier general, he was the assistant division commander from September 2003 to August 2004 of the 1st Armored Division, U.S. Army Europe and Seventh Army, in Germany. Hertling taught in the Department of Physical Education at the U.S. Military Academy, and served as a speechwriter for Gen. (ret.) Frederick M. Franks when he commanded TRADOC. COL Mark P. Hertling and Lt Col James Boiselle, "Coming of Age in the Desert: The NTC at 20", Military Review, September–October 2001, 64–65, October 9, 2002. LTG Mark P. Hertling, "The Year of the NCO: A Division Commander’s Perspective", Military Review, September 2009, Vol. 89, Number 5. Mark Hertling, "Growing Physician Leaders," published by Rosetta Books and Florida Hospital Publishers, May 2016. ISBN 978-0-7953-4808-2. DoD News Briefing, Operation Iron Hammer. – November 19, 2007. DoD News Briefing, Maj. Gen. Bergner and Maj. Gen. Hertling. – December 19, 2007. The Compassionate General Michael Holmes, CNN. February 9, 2008. DoD News Briefing, Operational Update: Maj. Gen. Hertling – May 21, 2008. US troops in Northern Iraq – Wolf Blitzer, CNN. May 23, 2008. DoD News Briefing, Northern Iraq Security Operations – July 27, 2008. US troops in Iraq – Wolf Blitzer, CNN. August 3, 2008. DoD News Briefing, December 8, 2008. Making Soldiers Fit to Fight – James Dao, New York Times. August 30, 2010. Soldiers Require Best Nutritional Benefits – Brian Williams, NBC Nightly News. December 13, 2010. Army Boot Camp Embraces New-Age Fitness – Frank Morris, All Things Considered. National Public Radio. December 28, 2010. Michelle Obama sees Military as Model for Fitness Effort, – Mimi Hall, USA Today. January 28, 2011. US Army Europe and the Future of Forward Presence, – Atlantic Council. July 11, 2011. US Army Europe Podcast: LTG Mark Hertling, – US Army Europe YouTube. Aug. 23, 2011. Conference of European Armies highlights success of longtime alliances, new partnerships, – Jorge Benitez – Atlantic Council. Sept. 22, 2011. Consensus scarce on future of overseas bases – Catherine Cheney and Charles Hoskinson – Politico. Oct. 23, 2011. Future of US Army Europe, - Vago Muradian — Defensenews.com Oct. 30, 2011. Rebalancing America's forces, The Downgrading of Europe, - The Economist. Jan. 14, 2012. U.S. Army in Europe eyes greater partner training, - Alexandra Hudson — Reuters.com Feb. 4, 2012. ^ "Lt. Gen. Mark Hertling COUNCIL MEMBER Army Veteran". President's Council on Fitness, Sports & Nutrition. Archived from the original on November 17, 2015. Retrieved November 15, 2015. ^ Mr. Michael Lewis (TRADOC) (September 30, 2010). "The Army's foundational building blocks of Soldier skills". U.S. Army. ^ "STAND-TO! - Soldier Athlete Initiative, August 17, 2010". U.S. Army. ^ "Army not changing physical fitness test – for now". The Huffington Post. ^ "404w Page Not Found (DTIC)". ^ "Whence Value Come". Combined Arms Research Library. October 16, 2009. Retrieved October 25, 2011. ^ "Insights Garnered and Gained". Combined Arms Research Library. Retrieved October 25, 2011. ^ "Narcoterrorism". Combined Arms Research Library. October 21, 2009. Retrieved October 25, 2011. ^ "Coming of Age in the Desert". Combined Arms Research Library. July 1, 2009. Retrieved October 25, 2011. ^ "The Military Media Relationship" (PDF). Retrieved October 25, 2011. ^ "The Year of the NCO". Army.mil. Retrieved October 25, 2011. ^ "A Soldiers Thoughts on Training, Leadership" (PDF). Retrieved October 25, 2011. ^ Thomas E. Ricks (August 20, 2012). "Gen. Hertling's trip report: Security and conflict in the Caucasus region, not frozen". Foreign Policy. ^ Mark Hertling (June 12, 2014). "The real reason Iraq is crumbling". Washington Post. ^ Mark Hertling (August 21, 2014). "ISIS: The only way to defeat it (Opinion) - CNN.com". CNN. ^ Mark Hertling (September 1, 2014). "ISIS: Why strategy in Syria will take time (Opinion) - CNN.com". CNN. ^ "Opinion: A case for doing more for Ukraine". MilitaryTimes. November 28, 2014. ^ Mark Hertling (January 7, 2015). "Paris terror attack: What videos reveal about killers". CNN. ^ Mark Hertling (March 5, 2016). "Donald Trump's military remarks: A soldier's view". CNN. ^ Morning Edition. "Military Family Reflects on Sacrifices of Iraq Service". Npr.org. Retrieved October 25, 2011. ^ "Army Ranks See Imbalance in Iraq War Sacrifice". Npr.org. July 12, 2007. Retrieved October 25, 2011. ^ "Operation Iron Hammer: Maj. Gen. Mark Hertling, Nov. 19 |". United States Forces – Iraq. November 18, 2007. Retrieved October 25, 2011. ^ "Maj. Gen. Bergner, Maj. Gen. Mark Hertling, Dec. 19 |". United States Forces – Iraq. December 18, 2007. Retrieved October 25, 2011. ^ "U.S. Planes Strike Al-Qaida Hideouts Near Baghdad". Npr.org. January 10, 2008. Retrieved October 25, 2011. ^ "The compassionate general". LiveLeak.com. Retrieved October 25, 2011. ^ a b "Operational Update: Maj. Gen. Hertling, May 21". United States Forces – Iraq. May 21, 2008. Retrieved October 25, 2011. ^ Morning Edition. "U.S. Bridging Gaps Between Baghdad, Provinces". Npr.org. Retrieved October 25, 2011. ^ "DVIDS – Video – Maj. Gen. Hertling". Dvidshub.net. May 23, 2008. Retrieved October 25, 2011. ^ "Northern Iraq Security Operations: Maj. Gen. Hertling, July 27 |". United States Forces – Iraq. July 27, 2008. Retrieved October 25, 2011. ^ "CNN.com – Transcripts". CNN. August 3, 2008. Retrieved October 25, 2011. ^ "DoD News Briefing: Maj. Gen. Mark Hertling, Dec. 8 |". United States Forces – Iraq. December 7, 2008. Retrieved October 25, 2011. ^ Weekend Edition Saturday (March 20, 2010). "New Basic Training Hardens 'Softer Generation'". NPR. Retrieved October 25, 2011. ^ Dao, James (August 30, 2010). "Army Revises Training to Deal With Unfit Recruits". The New York Times. Retrieved October 25, 2011. ^ "Nightly News: Soldiers require 'best nutritional benefits'". Clicker.com. Retrieved October 25, 2011. ^ "Army Boot Camp Embraces New-Age Fitness". NPR. December 28, 2010. Retrieved October 25, 2011. ^ Hall, Mimi (January 28, 2011). "Michelle Obama sees military as model for fitness effort". USA Today. Retrieved October 25, 2011. ^ "US Army Europe and the Future of US Forward Presence | Atlantic Council". Acus.org. July 11, 2011. Retrieved October 25, 2011. ^ "U.S. Army Europe Podcast: LTG Mark Hertling". YouTube. August 23, 2011. Retrieved October 25, 2011. ^ "Conference of European Armies highlights success of longtime alliances, new partnerships | Atlantic Council". Acus.org. September 22, 2011. Retrieved October 25, 2011. ^ "Consensus scarce on future of overseas bases – Catherine Cheney and Charles Hoskinson". Politico.Com. Retrieved October 25, 2011. ^ "Future of US Army Europe — Vago Muradian". DefenseNews.com. Retrieved November 2, 2011. ^ "Rebalancing American's forces". The Economist. January 14, 2012. Retrieved January 17, 2012. ^ "U.S. Army in Europe eyes greater partner training". Reuters. Retrieved February 10, 2011. ^ Talking Iraq on CNN w/Carol Costello: Tara Maller, David Gergen & Lt. General Mark Hertling. June 23, 2014 – via YouTube. ^ EUR.ARMY.MIL. "VII Corps Desert Storm 29th Reunion" (PDF). EUR.ARMY.MIL. Retrieved April 1, 2012. ^ EUR.ARMY.MIL. "Impacts of Doctrinal and Technological Changes, Organization for Security Co-operation in Europe Seminar 2011". EUR.ARMY.MIL. Archived from the original on May 13, 2012. Retrieved April 1, 2012. ^ EUR.ARMY.MIL. "RUSI Land Warfare Conference, Interagency and International Collaboration: Training with Allies for Great Coalition Interoperability" (PDF). EUR.ARMY.MIL. Retrieved April 1, 2012. ^ EUR.ARMY.MIL. "The Way Ahead, Conference of European Armies 2011". EUR.ARMY.MIL. Archived from the original on May 13, 2012. Retrieved April 1, 2012. ^ EUR.ARMY.MIL. "The Strategic Value of United States Army Europe". EUR.ARMY.MIL. Archived from the original on May 6, 2012. Retrieved April 1, 2012. ^ EUR.ARMY.MIL. "Marshall Center Program in Advanced Security Studies Seminar" (PDF). EUR.ARMY.MIL. Archived from the original (PDF) on May 13, 2012. Retrieved April 1, 2012. ^ EUR.ARMY.MIL. "V Corps Change of Command" (PDF). EUR.ARMY.MIL. Archived from the original (PDF) on May 6, 2012. Retrieved April 1, 2012. ^ EUR.ARMY.MIL. "USAREUR/IMCOM Combined Logistics Awards Ceremony". EUR.ARMY.MIL. Archived from the original on May 13, 2012. Retrieved April 1, 2012. ^ EUR.ARMY.MIL. "Wilton Park Conference 2012" (PDF). EUR.ARMY.MIL. Retrieved October 12, 2012. Wikimedia Commons has media related to Mark Hertling. Hertling, Mark (2012). "Obesity is a National Security Issue". Tedx Talk, YouTube. Retrieved 24 June 2017. This page was last edited on 1 February 2019, at 21:55 (UTC).